This morning Microsoft announced that its forthcoming Surface Pro tablet hybrid will become generally available in the United States and Canada on February 9th. As you certainly recall, the Surface Pro is a similar piece of hardware to the Surface RT, the largest difference between the two being their operating systems: The Surface RT runs Windows RT, and the Surface Pro a full-build of Windows 8 sans application restrictions. The release date for the Surface Pro is roughly inside the timeframe mentioned by the company when it indicated that the Pro would go on sale 90 days after the RT model. The company is updating its SKU lineup for the RT itself, adding the option for consumers to buy the 64 gigabyte version of the device without a black Touch Cover. This is not in any way a retreat from the Touch Cover experience, but is instead a calculated move to allow those purchasing the most expensive RT unit the chance to by the Touch Cover in the color of their selection, and not only in black, the bundled color until now. Also, in a bid to bolster sales and its tablet market share, Microsoft intends to ‘more than double’ the number of markets that the Surface RT is sold in by adding a number of 13 to its current tally. The Surface Pro – known officially as the ‘Surface Windows 8 Pro,’ a name TNW will not use – will go on sale in the same channel mix of the Surface RT: Online on Microsoft’s website, at every Microsoft Store, and in Staples, Best Buy, and Future Shop. As we have known, the Surface Pro packs an Intel Core i5 processor, just around half the battery life of the Surface RT, and a price starting at $899. For a doubling of internal storage, you’ll pay an extra $100. Finally, before we move to observations, Panos Panay, Surface’s boss, called the market response to it “exciting to see.” Leaked sentiment from inside of Microsoft, combined with the company’s reticence to release hard figures lend weight to the idea that it probably actually is not in fact excited, but slightly disappointed. The above are the brass tacks. We will now pivot to a few hands-on notes to help you grok just the company has built. From the front, it’s the same device as the Surface RT, fitting the same Touch and Type Covers, and with the same general look and feel. And color. In fact, if someone walked by you with one tucked under their arm, provided that you didn’t look too closely, you probably would not be able to detail which type of Surface it was. That said, once you start to look more closely, the differences become evident: the Pro is heavier, far thicker, and frankly a bit pudgy looking from certain angles. Microsoft, in what appears to be a bid to cut down on noise – the Samsung Series 7 tablet was infamous for its fans – has built a cooling system that in normal usage is all but silent. This is something to be applauded. This likely adds to its thickness, but everything has a cost. Pen input is a key part of what Microsoft envisions to be its selling point. I’m personally opposed to the technology, as I find it regressive, but there you have it. The Pro comes with a pen. As the Surface Pro is quite like the Surface RT, so too are its advantages and difficulties. However, though they both sport the same general configuration, the likely fill two different roles. 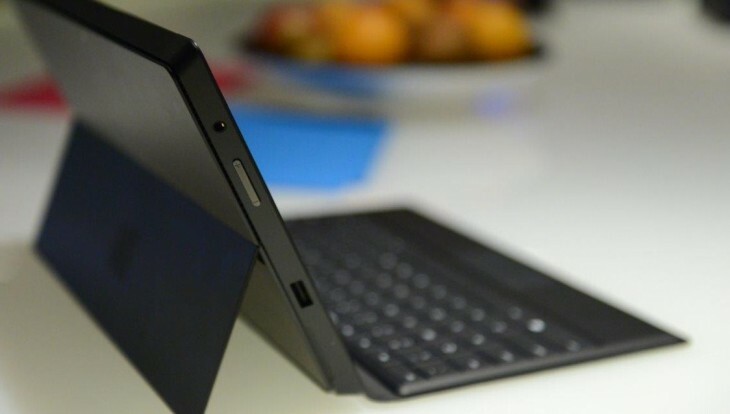 The Surface RT, Microsoft told TNW, can be thought of a tablet-first device that can function as a laptop. The Surface Pro, by comparison, is an almost-laptop that also makes for a fine tablet. Thus, in a sense, the Pro’s limited battery life should matter less than it otherwise would. Perhaps. Making that point, the Pro has a Mini DisplayPort, something that the RT lacks, as the Pro will likely spend more time on a desk than the its sibling. That said, the strong material and build points that Microsoft earned with the RT spill over to the Pro; it’s built with the same care and appreciation. If you don’t like Windows 8, the Surface Pro will do nothing for you. If you liked the idea of the Surface RT, but wanted a bit more power and flexibility the Pro could be a fit for you. Still, as Intel intends to push the price of its Ultrabook project to $599 by the end of the year, each with touchscreen capability, how much market space there is for the Pro is an open question.